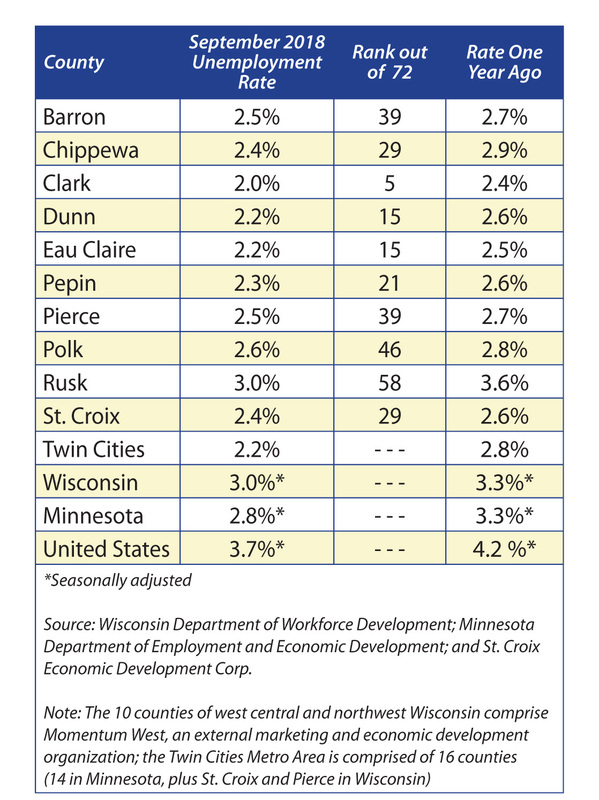 On October 24th, the Wisconsin Department of Workforce Development (DWD) announced the preliminary September 2018 unemployment rates for Wisconsin’s 72 counties and the 32 cities with populations greater than 25,000 residents. St. Croix County’s rate was estimated at 2.4%. For comparison, St. Croix’s final rate for August was 2.9% and July’s final rate was 3.0%. One year ago, the county’s unemployment rate was estimated at 2.6%. DWD said preliminary unemployment rates for September declined in 71 of the 72 counties when compared to September 2017, with 23 counties setting or tying all-time low unemployment rates for the month. The rates ranged from 1.8% in Iowa County to 5.5% in Menominee. The September 2018 preliminary unemployment rates declined or stayed the same in all 32 of Wisconsin’s largest municipalities when compared to September 2017. Seventeen of the 32 largest municipalities set or tied their lowest September unemployment rate on record. Rates ranged from 1.9% in Fitchburg to 4.2% in Racine. The five counties with the lowest unemployment rate in September include Iowa (1.8%), followed by Lafayette (also at 1.8%), Dane (1.9%), Clark (2.0%), and Green (also at 2.0%). Menominee County had the highest rate in September at 5.5%, followed by Iron (4.6%), Forest (3.6%), Milwaukee (3.5%), and Florence (3.4%). St. Croix, Pierce, Polk, and Dunn counties comprise Wisconsin’s Greater St. Croix Valley. In addition to St. Croix referenced above, September’s preliminary rate in Dunn was estimated at 2.2%, followed by Pierce at 2.5% and Polk at 2.6%. The current rates are lower in all four counties compared to the rates for September 2017. St. Croix and Pierce counties are included in the 16-county Minneapolis-St. Paul-Bloomington MN-WI metro area. The September 2018 unemployment rate for the Twin Cities was estimated at 2.2% which is lower than August’s final rate of 2.5% and July’s final rate of 2.6%. The unemployment rate in the Twin Cities was 2.8% in September 2017. The preliminary (seasonally adjusted) unemployment rate for Wisconsin in September was estimated at 3.0%, which is the same as August’s final rate, but higher than July’s final rate of 2.9%. One year ago, the state’s seasonally adjusted rate was 3.3%. The preliminary (seasonally adjusted) unemployment rate in Minnesota in September was estimated at 2.8%, which is lower than August’s final rate of 2.9% and July’s final rate of 3.0%. Minnesota’s seasonally-adjusted rate one year ago was 3.3%. The preliminary (seasonally adjusted) unemployment rate in the U.S. for September was estimated at 3.7%, which is lower than the final rate 3.9% for both August and July. One year ago the U.S. rate (seasonally adjusted) was estimated at 4.2%. 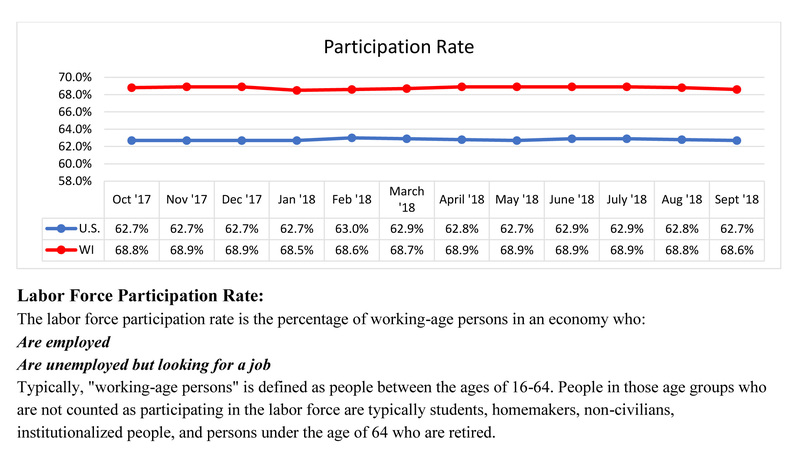 Wisconsin’s preliminary (seasonally adjusted) labor force participation rate for September 2018 was estimated at 68.6%, which is lower than August’s final rate of 68.8% and July’s final rate of 68.9%. One year ago, Wisconsin’s labor force participation rate was 68.8%. The preliminary (seasonally adjusted) labor force participation rate for the U.S. in September was estimated at 62.7%, which is the same as August’s final rate, but lower than July’s final rate of 62.9%. One year ago, the labor force participation rate in the U.S. was 63.0%. September’s estimates are preliminary and are subject to revision within the next few weeks.